I have always been a “Space Junkie!” I can remember in grade school listening to a small radio via earphones (super-early iPod-like activity!) of space missions like Mercury and Gemini… then on the moon landing… I was in Idaho at the National Boy Scout Jamboree… I was 13 years old… and I was following the moon landing via that small radio. Later that night, we got to see the moon walk on a GIANT screen at the Campfire. WOW! Now, if we could only get the Space Program BACK in gear! Congrats to the three men that were heroes to us all on the 40th (choak!) Anniversary of the Moon Landing! Our government is stupid. Anybody that has dealt with bureaucracy knows this… but, imagine, the State Department would like Clinton to allow them to use a FREE (that means no cost) SAFER web browser (you would think that would be important at the State Department)… but wait! It is TOO EXPENSIVE! Did I mention it is FREE? Oh, but it would take too much overhead to keep it patched! But wait, it notifies the user and can be patched with one click… for FREE! OK!!! Dept. of State Would Like to Use Firefox… but Can’t! Kennedy: Nothing is free. (Laughter.) It’s a question of the resources to manage multiple systems. It is something we’re looking at. And thanks to the secretary, there is a significant increase in the 2010 budget request that’s pending for what is called the Capital Investment Fund, by which we fund our information technology operations. With the secretary’s continuing pushing, we’re hoping to get that increase in the Capital Investment Fund. And with those additional resources, we will be able to add multiple programs to it. Ignorance can be cured, but there’s no cure for stupid! In Honor of Today Being Nikola Tesla’s Birthday… Geek Culture! 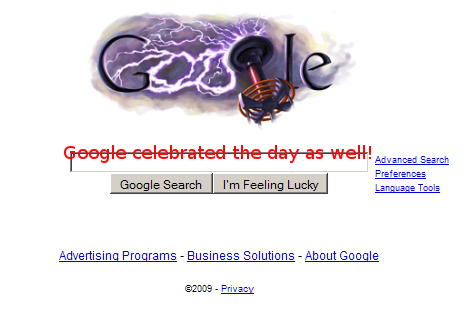 Nicola Tesla, inventor of many high tech things would have been 153 today… so here you go… happy geeky celebration! M$ Silverlight 3 is out… do we care? M$ (Microsoft, for you that don’t regularly follow my Blog) just released the new version of their Flash alternative, Silverlight… now at version 3.0. 99% of the world uses Flash… Silverlight is light, fast, and may even be cool… but, it doesn’t have the marketshare, one of the few M$ products that doesn’t… what does that say? Time Warner Triad… PAY ATTENTION! Anyway, I am sure that they are telling the local commercial buying companies that this “increasing the volume” bit is a GREAT idea to catch people’s attention… well, guess what, local vendors that are paying good money for your commercials to run… I sit with my finger on the MUTE button, and as soon as they blare out at me, I happily, gleefully, with MALICE… hit the MUTE BUTTON to silence the commercial… so, I NEVER HEAR YOUR MESSAGE!!!! So there! Time Warner… are you listening??? You are “out-smarting” yourself, OK?!?!? We aren’t listening to your LOUD COMMERCIALS! Anybody else out there doing what I am doing?!? If so, write them… send me comments to this post… let me know I am not the only one ticked off!!! Microsoft has patches for you… hot off the press! The final critical patch will be a Windows OS fix addressing RCE exploits. It’s considered “critical” for Windows XP but “moderate” for Windows Server 2003. First on the ‘important’ list will be a virtualization fix — something to be seen more often, perhaps. It will be a patch to stop potential elevation-of-privilege attacks in Microsoft Virtual PC 2004 and Microsoft Virtual PC 2007 editions, as well as Microsoft Virtual Server 2005 R2 and Virtual Server 2005 R2 x64. The next important patch will address Microsoft Internet Security and Acceleration Server 2006. ISA Server provides application-layer firewalling and protects Web servers. The server is being rolled up into Microsoft Forefront Threat Management Gateway, which Redmond calls a ‘comprehensive secure Web gateway solution’ protecting client-side users from Web-based threats. The third important item deals with 2007 Microsoft Office System Service Pack 1 in general, and Microsoft Office Publisher 2007 Service Pack 1 in particular. It is the rollout’s fourth RCE exploit fix. Depending on which components are included in Tuesday’s announcement, July looks to be a reasonably busy month for IT pros. The entire slate of patches may require restarts. Google Gets Into the OS Wars! The Official Google Blog says that they are developing an Open Source Operating System starting out for Netbooks… and, then the world! Well, OK, I added the last part! Anyway, I like the fact that they are big enough to give Microsoft a run for their money! Competition is GOOD! Rock on… I wish them well! Ever needed to resize a live disk volume? I did recently… and you know me… I gotta find a free way to do it! So, another GSotW! EASEUS Partition Master! This program rocks! There is a free home version, and a very reasonably priced Pro and/or Server Version if you need 64 bit support! VLC Player is now at 1.0! Wow! VLC Player is the BEST video/audio player available… supporting more file formats than most people will ever encounter… truly a player for geeks! And, now, it has reached the gold version of “1.0”… in Open Source-speak that is truly “production!” So, download and enjoy! And, Gmail and other Google apps came out of Beta today… there must be a convergence of the stars, or something!